The registry is critical for health of the system, sometimes even a small tweak, may corrupt windows registry and prevent you from logging in. To take the back up of the registry open registry editor from start > Run, type Regedit and press enter. 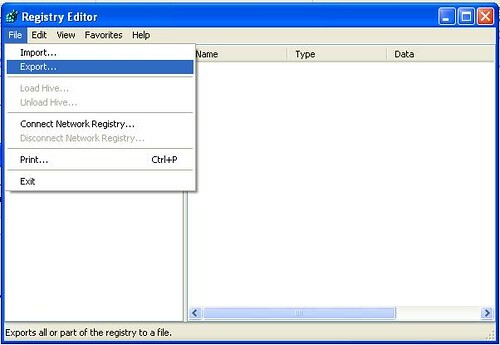 In Registry editor, under browse panel, select the highest key, which is wither "Computer" or 'My Computer' depending on version of your Windows OS and then from top level menu in registry editor select File > Export, give the location where you want to store the back-up, and its done - backup of complete registry. One can also do selective backup for a particular key, it can be done in same way - just select that key you needs to be backed up from left browse panel and then click on top-level File menu > export, this would just backup the selected key. The registry backup files are stored as ".reg" files. To restore from backup again you can simply double click the backup file, or in Regedit, click on File menu > import from Registry editor. Alternatively, users using Windows ME and higher can also create system restore points, to save all the current settings of windows (including registry). To do this navigate to start > program > Accessories > System Tools > System Restore, and select 'create a restore point'. To revert to this point later, you have to just select the point again to restore.